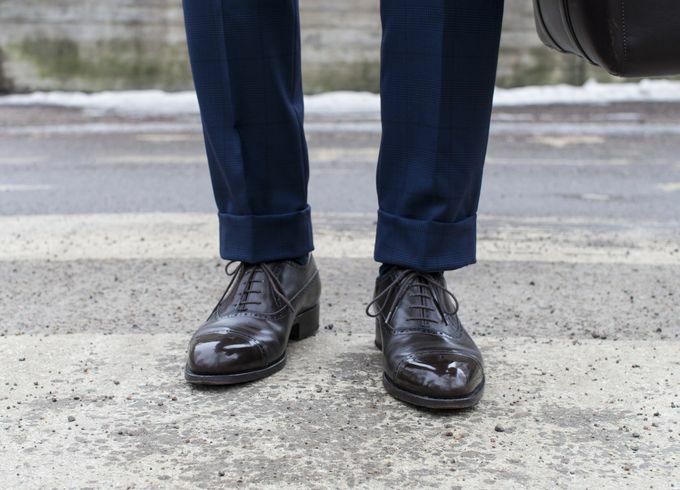 One of the topics that comes up quite often is if it's apropriate to wear brown shoes in a business setting. While the answer differs by location, it can quite safely be said that dark brown Oxford shoes are good for business in most occasions. The black shoe requirement tends to be quite office specific and more common in the big centers of business such as London or New York. Even there it's not really the standard anymore as more and more companies have started accepting more casual intepretations of the business attire. In Finland I only know of a single office where the black shoe requirement stands, and it's not much different all across Europe. 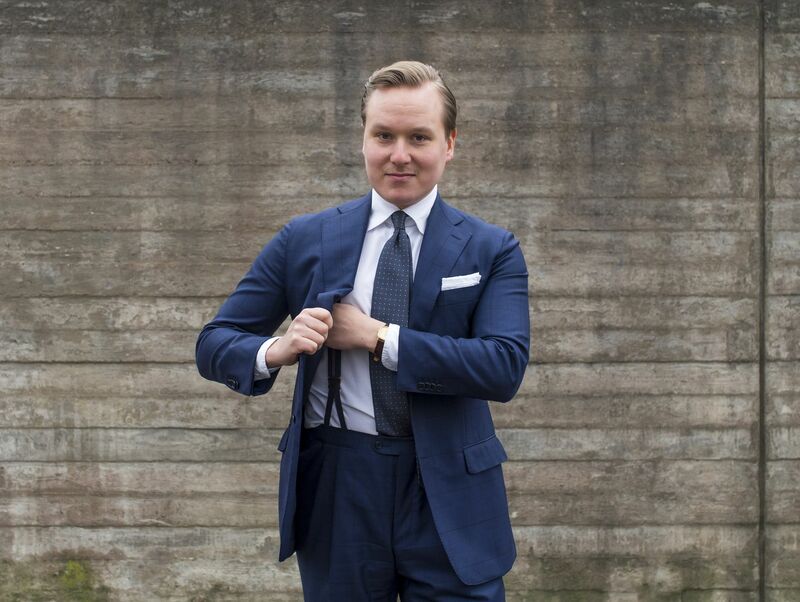 The items worn in this look include a wool coat from Lardini, mtm shirt from Luxire, mtm suit from Vaatturiliike Sauma, silk tie from Viola Milano, cotton linen pocket square from Berg & Berg, suspenders from Drake's London, socks from Berg & Berg, Balmoral Oxfords from Vass and a briefcase from Linjer. 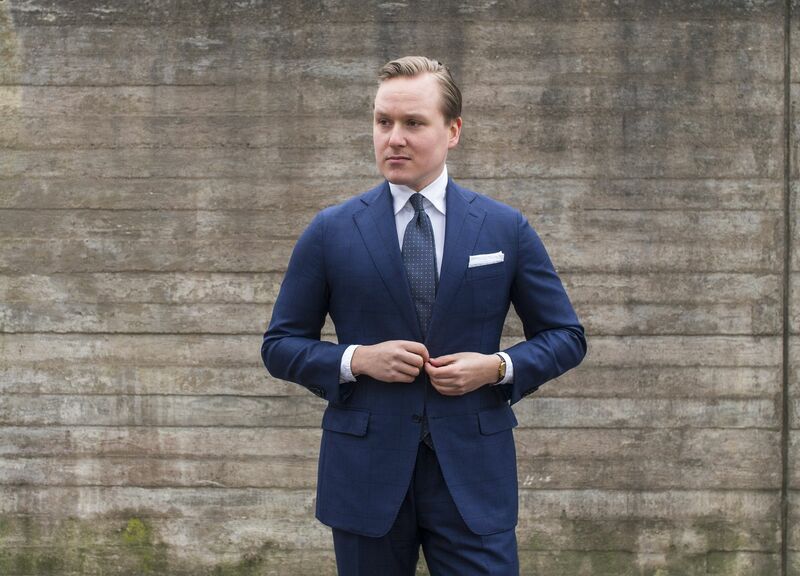 A softly-tailored unlined suit is something I wouldn't trade for anything. As long as the fabric is fit for the season, it is always the most comfortable option and will keep you happy even in long days of work or, for example, traveling. 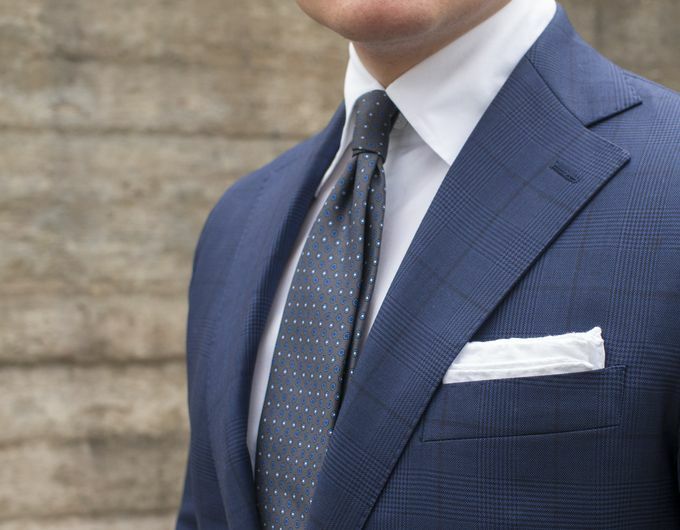 This particular suit is made from Ariston's 270 g/m2 four season wool fabric that has just about the right weight to be comfortable during a nice summer day but also warm enough when it gets colder. 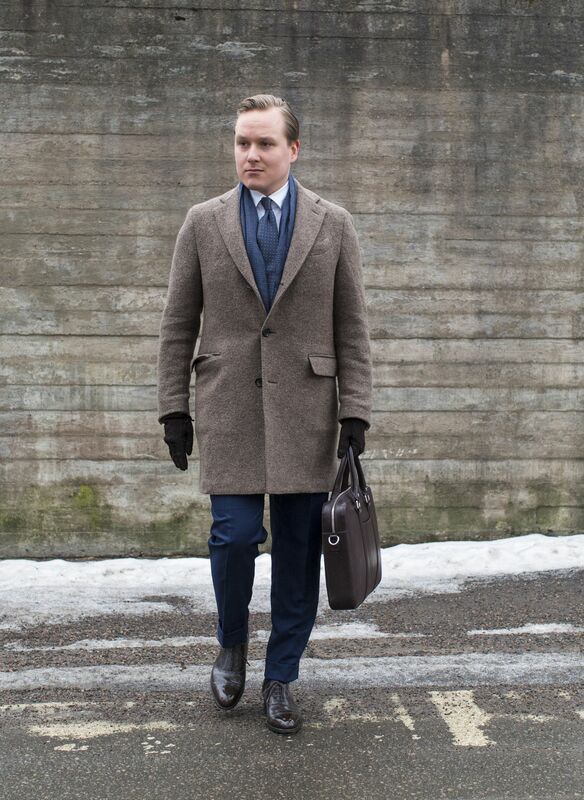 Furthermore, the feel and look (texture wise) of the fabric give it just the right amount of roughness to look apropriate even during the colder Finnish winter. I've personally grown fond of this type of versatile fabrics, as they will give you a proper four seasons suit for the price of one, given you've chosen a versatile enough color. A neat grey floral print silk tie is a good option for any day conducting your business. Pair it with a crisp white cotton or linen pocket square with handrolled edges and you've got yourself the business look to rule them all. 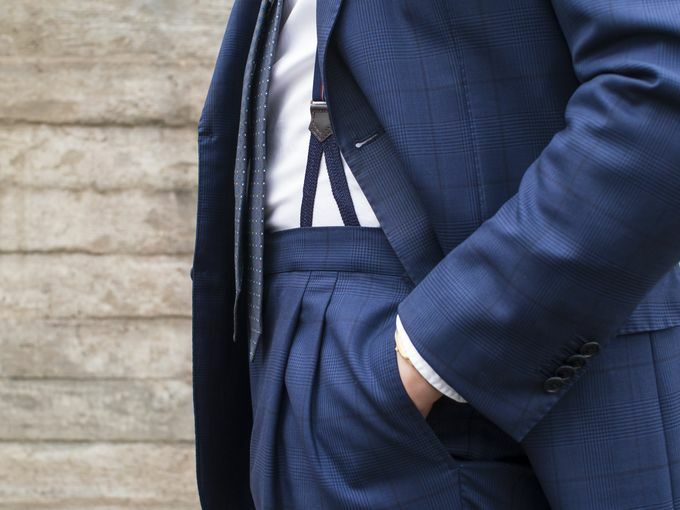 Suspenders are a great way to add comfort and a touch of elegance to your outfit. While a belt actually draws attention to your gut area and often lets your trousers fall out of the optimal height every now and then, the suspenders do their job quietly out of sight. They work best with a higher rise suit trousers and with leather or canvas ends. The metal clip on ends may look a little bit too accessory for a very formal look, so I'd avoid them if the goal is understated class. I'd also recommend avoiding bright-colored suspenders unless you're going to a 1980s party playing Gordon Gekko. And then, shoes. Dark brown shoes are a good way to liven up a classic corporate look, especially if you're wearing dark blue or navy. With grey, I'd usually recommend wearing black shoes and leather accessories, simply because of how the colors work together. With different shades of blue though, browns tend to look quite amazing. Dark brown looks especially elegant and is definitely proper for most work situations. This elegance is further amplified by a large margin if you polish your shoes well, as this is really the point where brown leather starts to show its character. Can you wear brown in town? Let me know either here or Instagram and let's see if people agree. Next week we'll most likely have a review of my new pair from Vass or a review of my new pair from Crockett & Jones, so the shoe theme will continue then.